The ambition of the sillages.info initiative is to reach a collaborative production of multimedia content (L0, L1 and L2 levels) for scenarised and interoperable resources complementing the present online availability related to the French higher education, and especially for the access to the grandes écoles (focussing on business, sciences, and humanities). A MOOC website offering MOOC in Computer Sciences, French Grammar, Greek, Latin, Gender Equality. 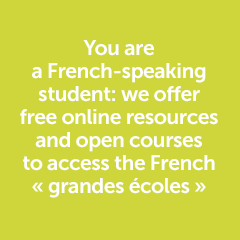 The French Digital Universities (UNT) websites : searching « sillages » on these websites gives access to all sillages.info resources (courses, exercises, practical trainings…) : AUNEGE for economic sciences, UNISCIEL for fundamental sciences, UOH for litterature and languages. A wiki devoted to complementary resources. The sillages.info initiative is developed through 80 francophone actors (from Cambodia, Cameroon, Canada, France, Greece, Lebanon, Switzerland, Tunisia…). Detailed information on how to join our community are available here (in French). The sillages.info initiative initiative was launched in 2010 and coordinated until 2017 by Nathalie Van de Wiele, founder of ePrep in 2001. From 2011 to 2017, the initiative was under the governance of the sillages.info Association, which members are Conférence des grandes écoles (CGE) and ePrep ; Grandes écoles (École normale supérieure, École normale supérieure de Cachan, École polytechnique, EDHEC, ESSEC) ; non-for-profit organisations (APLCPGE, ADEPPT, APPLS, Passeport Avenir) ; French Digital Universities (AUNEGE, UNISCIEL, UOH). OMERIC, ePrep’s partner since 2006, was an important technical partner of the sillages.info initiative until 2017. Since 2017, the sillages.info initiative is under the governance of AUNEGE, UNISCIEL, UOH in association with representatives of the sillages.info community.